When an audience member started to press Polis for a commitment to ban certain gun equipment, the candidate hesitated to make any promises. He agreed it was time to take “weapons of war” off the street but didn’t make promises on any equipment bans. A few in attendance audibly took issue with Polis’ refusal to provide a clear “yes” or “no,” but he promised to stand up against gun lobbyists even while supporting responsible gun ownership. That’s all the Greeley Tribune tells us in this article about the grand opening of Polis’s campaign headquarters there. But at least they reported it. We would love to know what it sounded like when Democrats “audibly took issue” with their fellow Democrat on the issue of gun control. Does it sound like the jeering and boos launched at Coffman, or do Democrats give their own a pass when they decline to embrace gun control? If anyone has a video of the event, please post it on our Facebook page. While Polis called for stricter gun control after the Las Vegas shooting last year, he’s been inching his way towards a more western viewpoint when it comes to the 2nd Amendment and gun ownership. Polis has consistently received poor ratings of 7 to 10 percent from pro gun groups over his years in Congress, while raking in 100 percent lovefests from groups that lobby for gun control. Now that Polis is running for governor, he is saying that illegal guns that are already illegal to own (weapons of war), should continue to be illegal. He won’t commit to banning anything. He supports “responsible gun ownership,” and will stand up to the gun lobby, which by the way supports responsible gun ownership. 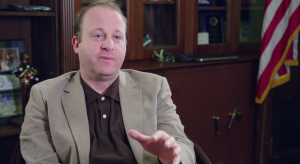 We wonder what Democrats would think of Polis, if more than one media outlet (well, now two) had reported it?